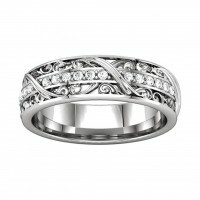 Browse our beautiful selection of Diamond Anniversary Band. 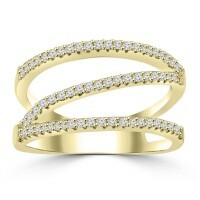 Each diamond eternity band and ring is available in Platinum as well as 14k or 18k yellow, rose or white gold. 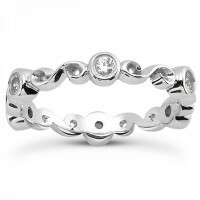 We are diamond jewelry wholesalers and are able to offer you the lowest possible price on men's and women's diamond jewelry, including a great selection of very unique diamond eternity bands. 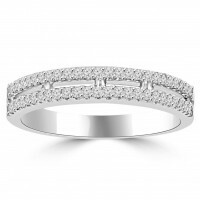 From channel and invisible set diamond bands to pave and prong set diamond eternity bands, Madinajewelry.com offers you the most luxurious selection of diamond anniversary rings at guaranteed lowest prices. Every diamond anniversary ring we offer can be customized with different color diamonds and is available in 14k-18k white gold, yellow gold, rose gold or Platinum. Here’s a very unique twist on a classic jewelry design. What’s unique about it is the lovely s..
Here’s a very unique twist on a classic jewelry design. What’s unique about it is the lovely sett.. Fabulous!!! 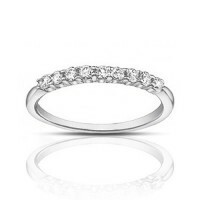 This is truly a wonderful natural 0.40 ct round cut diamond Anniversary Ring on solid 14.. Fabulous!!! 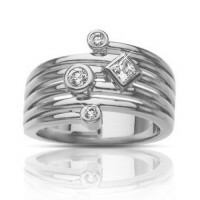 This is truly a wonderful Natural 0.45 ct round cut diamond Anniversary Ring on solid 14.. 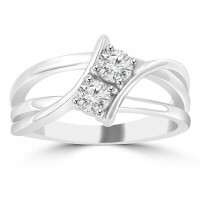 This elegant 14 kt white gold women's prong set ring with round diamonds weigh approximately 6 grams..